Mutiny zine 69 out now. Greetings, Mutiny 69 has been printed and is available online! It is available on Scribd. Articles are also available in an easy-to-read format on our blog. For Sydney folks hard copies can be found at Jura Books and at the Black Rose space. Author disaccordsPosted on April 29, 2013 April 28, 2013 Categories UncategorizedTags anarchist project, anarchists, Mutiny zine, zineLeave a comment on Mutiny zine 69 out now. 23 April: Vandals defaced a Liberal Party billboard in Perth just hours after it was unveiled by Opposition Leader Tony Abbott. 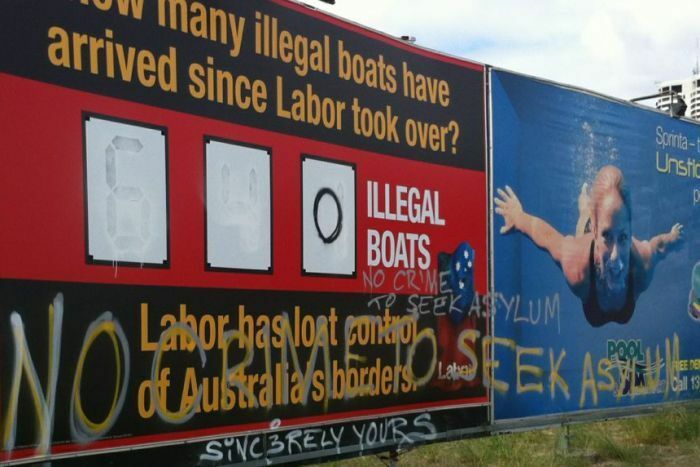 The billboard claimed more than 600 “illegal” asylum seeker boats have arrived in Australia since the Labor Party won government. The number has since been whited out and replaced with a zero. The sign has subsequently been replaced with a previous Liberal Party add. April 14: PolAir4 was conducting air patrols of Sydney’s west about 12.30am when a laser pointer was allegedly shone at the crew from a car in Hebersham. The chopper crew alerted Mt Druitt Police, who were patrolling nearby, and they intercepted a Hyundai Elantra on Hyatts Road at Plumpton. A 19-year-old man sitting in the passenger’s seat was arrested and a laser pointer seized. Hidup Biasa: An expression of people’s desire for freedom, cries of “Papua Merdeka” continue to ring out through the cities, mountains and forests of West Papua. The struggle is against fifty years of Indonesian rule, which throughout the last half-century has violently tried to subdue Papua, in its attempts to create a unified nation from the 17,000 islands that once made up the Dutch Empire. 18 April: A riot broke out at Pasar Minggu Station, Jakarta, when authorities attempted to evict street vendors on Thursday, April 18. A number of street vendors, aided by students from the University of Indonesia, stood up against roughly 900 officers from PT Kereta Api Indonesia (KAI) who tore down their stalls. The riot leads to the death of a street vendor who died because of a heart attack. Another street vendor has to suffer a broken arm from trying to stop the officials. “Why does are our stalls being torn down?” said Tian Novita, a 27 year old street vendor. She claimed that she does not receive any notification about the eviction. Agus Sutijono, Head of Public Relation at KAI’sJakarta Operational Region One, stated that the street vendors have been notified since December 2012. “It’s not being torn down, it’s being put in order,’ said Agus.